We are around double what was forecast and the rains continue to come! There is another storm scheduled for tomorrow evening and rain is expected to return next week. Situations like this can reverse as rapidly as they came but for the moment the news is definitely good! P.S. I promise to send this rain eastward - by air express of course! It appears we will continue to be in a wet regime that should guarantee that we exceed normal rainfall for November and at least make a dent in the deficit resulting from the dry previous months. Drought sufferers applaud your good news. I've make my inspections of the house and checked to make sure the rain gauge is clear. Bring on da' wet! Hoping for the best. Rain at your house means snow at one the next day. 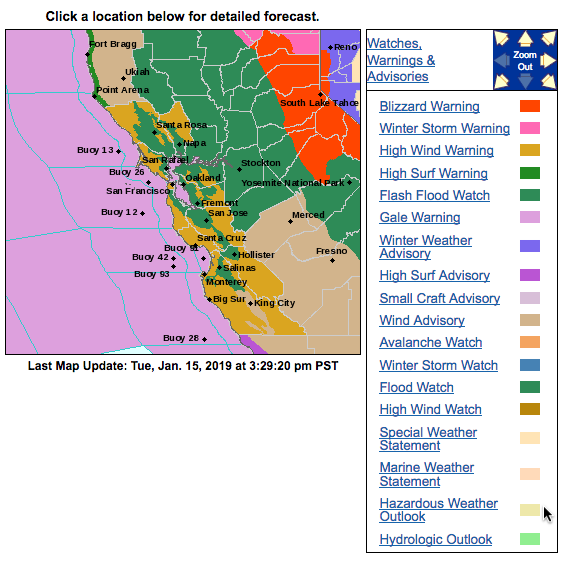 It does appear that the Monterey office of the National Weather Service is getting a wee bit nervous . . . . . .
Lucky us, every color is a shade of potential trouble! They have further revised their rainfall estimates upward. So assuming we don't drown, it certainly should make a dent in the rainfall quota! I like all those colours. 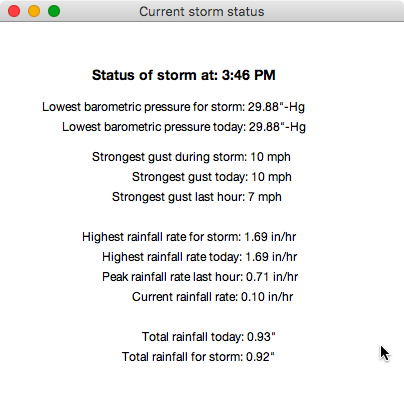 And looking at your website, I have confirmation of actual rain in the bucket, which is great news. We have had a little snow here but a lot is forecast for tomorrow, which means it must be raining at your house today. Praying that it will continue. Sunniest day on record: Apr 16, 2015 with 23.5 hours of sunshine. Did this miraculous day disturb your sleep at all? 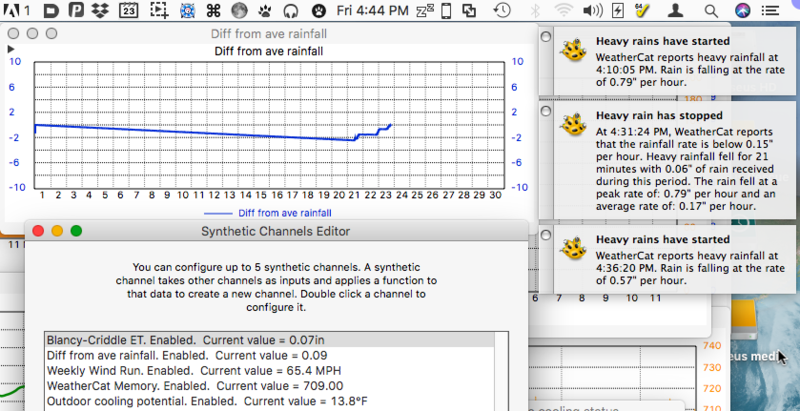 And one additional question: What is the difference between a rain day and a stormy rain day in your Year-over-year statistics? But, but, but! This is coming out of the catch all WeatherCat tag STRECORDS$ The STAT$ tag seems to confirm the value but I don't know of a way with the STAT$ tag to get a date of event. 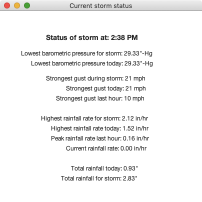 I took a look at the WeatherCat data for April 16, 2015, but sunshine hours is computed and I'm not sure how it does that. Perhaps when Stu is finally given a breather, we can ask him how to fix this one. This is coming from the STYEAROVERYEAR$ catch all tag. Honestly I don't know and I couldn't find the answer in the WeatherCat manual! I'm afraid this is another one we'll have to ask Stu when he finally get a chance to catch his breath. Never a dull moment for us WeatherCat users! This poor tree has lost quite a few limbs and is now leaning seriously to the south. 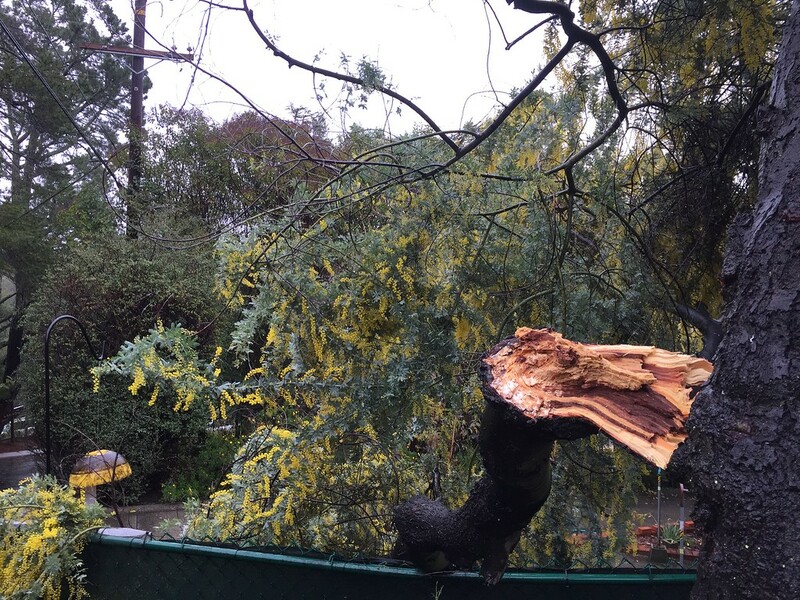 It is time to ask our arborist to come by and take another look. I do hope the tree isn't suffering from a disease or something.